At the end of 1909, President Taft made his fateful decision under recent food labeling laws that whiskey was any distillate from grain but excluding molasses or other fermentable sources such as grapes. This meant it could be any proof before dilution for bottling. Neutral spirits distilled at 95% purity of ethanol in a column still qualified, as did whiskey distilled at much lower proofs and aged in new charred barrels in Kentucky and Pennsylvania. The only proviso was labels must indicate when mixtures of neutral spirits and straight whiskey were offered as whiskey. In essence, this scheme exists today under the “Standards of Identity” that govern U.S. whiskey. This was a victory for the “rectifiers” and others who utilized neutral spirits (or something similar, as Canadian distillers) in their production. Earlier I reviewed the arguments deployed in particular by Canadian Club which helped achieve success. In 1911, two years later, the decision still rankled among some who felt that neutral spirits should not be called whiskey. One was Hugh J. Reynolds, a prosperous wine and liquor merchant in New Haven, Connecticut. Reynolds was a feisty guy, he had a long history of advertising in the local press which correlatively gave him space on issues like this. The papers covered his comings and goings, his next European tour, his support of Catholic charities (he was an Irish immigrant) and similar doings by a respected local citizen. Given National Prohibition was only a few years away, it was an anomaly to see him lionized in this way, but clearly he was a good customer and also, that part of the northeast seems to have had a more tolerant “public” attitude to alcohol even as WW I approached. Reynolds was a carriage trade merchant, and Yale University students figured among his clientele. This “gentry” aspect perhaps put a bubble around figures like Reynolds in his community. And so, a local paper devoted many column inches in 1911 to Reynolds’ opinions on the now-resolved whiskey labelling question. In summary, he approved of long aging of straight whiskey, not even four years (a modern industry standard), but between 10 and 12 years. His opinions on whiskey technically seem basically correct, but requiring 10-12 years aging seems a bit of a stretch. That length of time can impart a woody character to whiskey and he himself states he doesn’t think whiskey should be woody. He was correct that chemical changes over a prolonged period lend whiskey a mild and pleasant character, but that does not require 10-12 years to achieve, at least today. Some of the pot-distilled or other bourbon distillates of his time, coming off the still not much above 100 proof and with a high rye content, may have required longer than four years to soften down, but again 10-12 seems overly long as a general standard. Certainly today, four-to-eight year old bourbon or rye achieves most of the necessary changes while preserving essential whiskey character. Reynolds appears to have been something of a character himself, tilting against the windmills, the zeitgeist, by devoting a large amount of space to questions that were fairly obscure and relevant to an industry on the precipice. Maybe he saw the writing on the wall and decided to go out with a beau geste. More likely, he just had the fighting spirit. He died at 80 in 1918, no doubt shocked by the successful drive, hastened by wartime conditions, to ban alcohol everywhere. He had a good run certainly, having been in business for almost 40 years by then. His store was located on Crown Street in New Haven, near a grand opera house. The street seems very different today. His opinions may be read here, in the Bridgeport Evening Farmer. A new food book drew my interest recently based on an article in the New York Times. 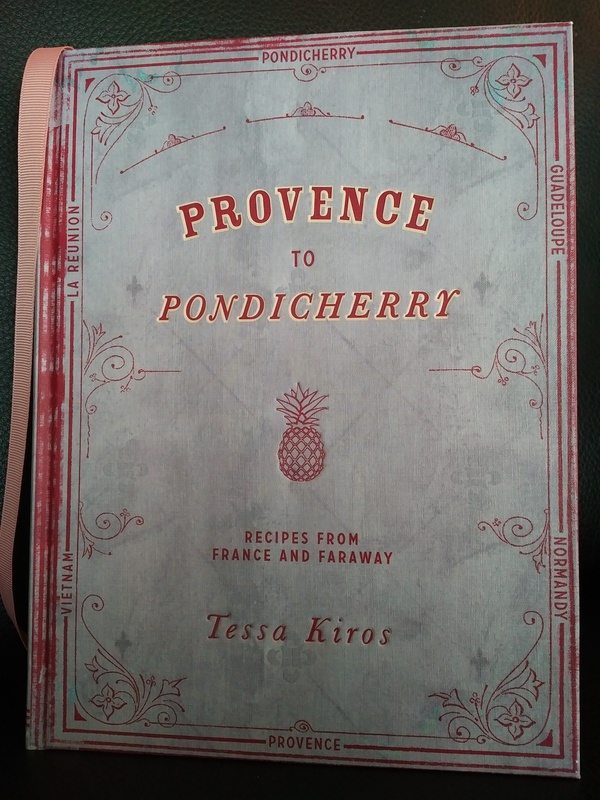 It’s Provence to Pondicherry by Tessa Kiros, published by Quadrille Publications. The author has numerous books to her credit, covering different Mediterranean cuisines and other topics in food and travel. She was born in England, raised in South Africa, and lives with her family in Tuscany. The premise of the book is how French cuisines influenced food in overseas French possessions, in this case Guadeloupe, Vietnam, La Réunion, and Pondicherry in India. It’s a great idea certainly and the book achieves its object well. Books or parts of books have been written on the interaction of English and Indian cuisines, but not so much on France and its former possessions as far as I know. In Provence to Pondicherry, the history is handled accurately but lightly, with a focus on flora and fauna, food, and people. The book is very well-designed with the cover evoking a lightly distressed 19th century French tome. The photography, by Manos Chatzikonstantis, is superb. Many of the images are arranged in “picture book” collage which suits the subject matter perfectly. The writing is at once lively and musing and evokes well the areas visited. It pinpoints the various elements which together make a cuisine and culture: not just the produce of land and waters but weather, architecture, what people wear. In France, Normandy and Provence get close attention as vessels departed their ports to bring settlers, ingredients, methods to distant areas. A telling observation is that, choose elements of the Provence repertoire even at random and they usually will match well. It’s true in fact of many long-settled societies, over time things in a cuisine just “fit”, a slow process of adaptation and accretion, often unconscious. There are many good travel notes, e.g., the contrast of brightly coloured plastic chairs with old weathered walls in Vietnam, underscored well by a photograph. The recipes are carefully written. The author gives a mussels recipe for each region, so five or six of them, which permits a “compare and contrast” with metropolitan French versions. Classics abound, especially from Normandy, but recipes less encountered are also included. For most readers, the recipes of the former colonial regions will be quite novel. The bananas and rum one looks great, a dish I’ve enjoyed occasionally in the past. I liked also the way the typical French loaf is combined with local ingredients or preparations in Vietnam. The Guadeloupe section resonated in particular as it recalled a fine dish I once had in Marigot, Saint Martin, a white fish bathed in lime juice. It illustrated well the book’s theme, that ingredients and methods of La Francophonie can combine to great effect. One hopes a second volume will follow which covers other areas the French settled. Louisiana and Quebec are two which come to mind, but I’m sure there are others. 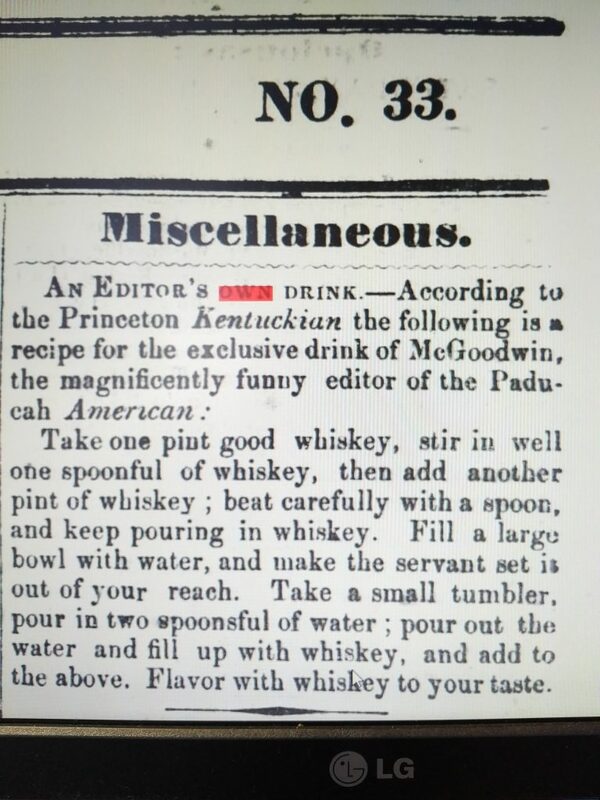 A number of newspapers in 1855-1857 reprinted the story of a Kentucky editor’s “exclusive drink”, or favourite recipe as we would put it. The one below is from the Opelousas Courier, in Louisiana, July 21, 1855. Now the Kentucky people know whiskey, they invented the premier American version of it. Is it reading too much to discern a jape against the emerging cocktail culture? Maybe by 1855, the work of bourbon pioneer Dr. James Crow done, his “red crettur” aged for years in charred wood was so good that this recipe expressed the final verdict of the cognoscenti. Or maybe the editor, John D. McGoodwin, was just one funny dude. He seems to have been involved only briefly in the newspaper business in Paducah, KY. Perhaps his interest in whiskey and comic routines explains why. Note re images: the first image is an image I took from the news story referenced in the text, available via the Chronicling America digitized newspaper resource. 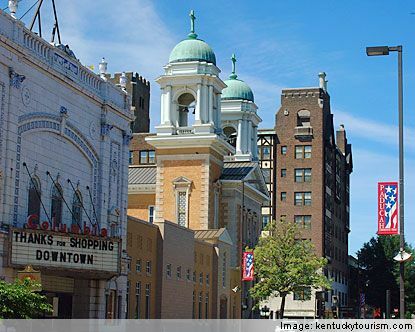 The second image is from the Kentucky Tourism website, www.kentuckytourism.com. All intellectual property in the images belongs solely to their lawful owner or authorized users. Images believed available for educational and historical purposes. All feedback welcomed. 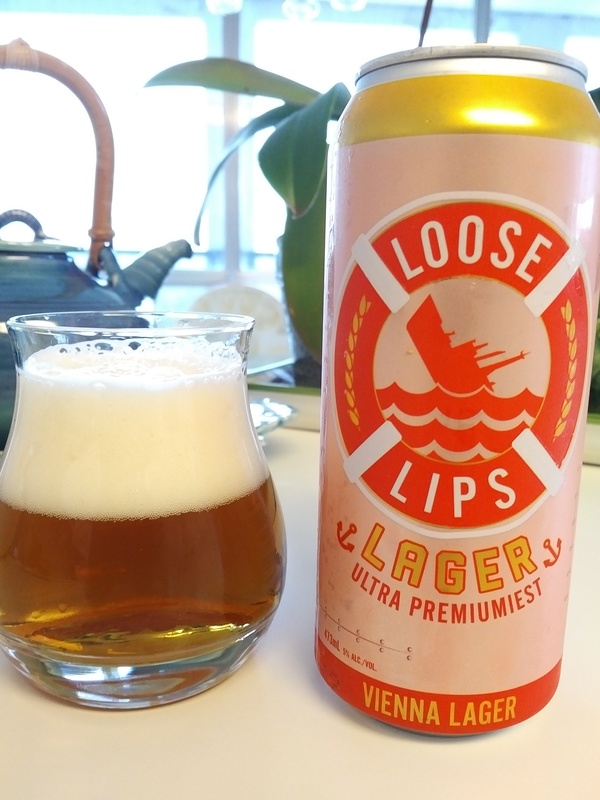 A recent craft offering, I’d guess Loose Lips is brewed by Cool Brewing in Toronto. The Cool company brands are mass-market styled but it supplies many very distinctive brands for the craft brewing segment, basically it can brew anything and very well. This beer has (what seems) the Cool yeast background and general company style but is fuller-flavoured, maybe like some Canuck brands of the 1950s. It’s the “Canadian” taste with something extra. With this you want good fries and a banquet burger after the hockey game. Nice packaging too. I wonder how many under 50, even well-educated, get the double entendre of the name and design. This would be a great beer, as well, for a Canadian Legion oyster party. Do they still hold them? If so I’m there. 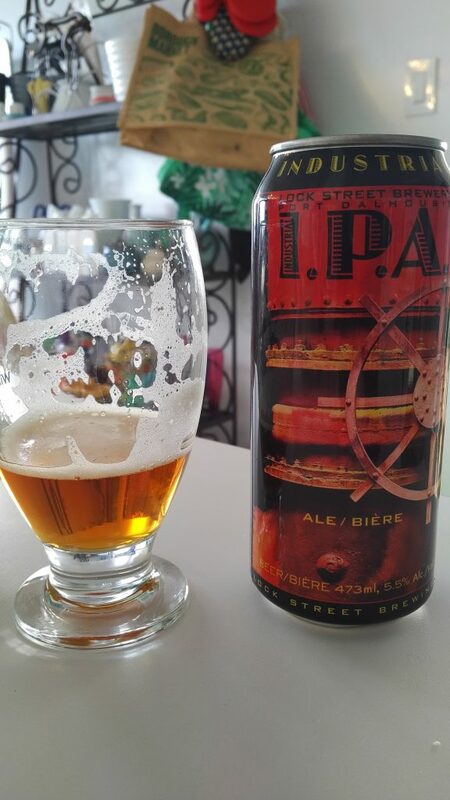 This IPA is just as the name “industrial” suggests but in a craft sense: heavy duty, big brush strokes vs. pointillist, a little rough around the edges. Lotsa taste, where an oddly elegant pineapple/tropical entry is run over by a dank/blackcurrant finish. Good to bolt one of these after “one of those weeks”, or at a monster truck rally. It’s another way of saying, me like. 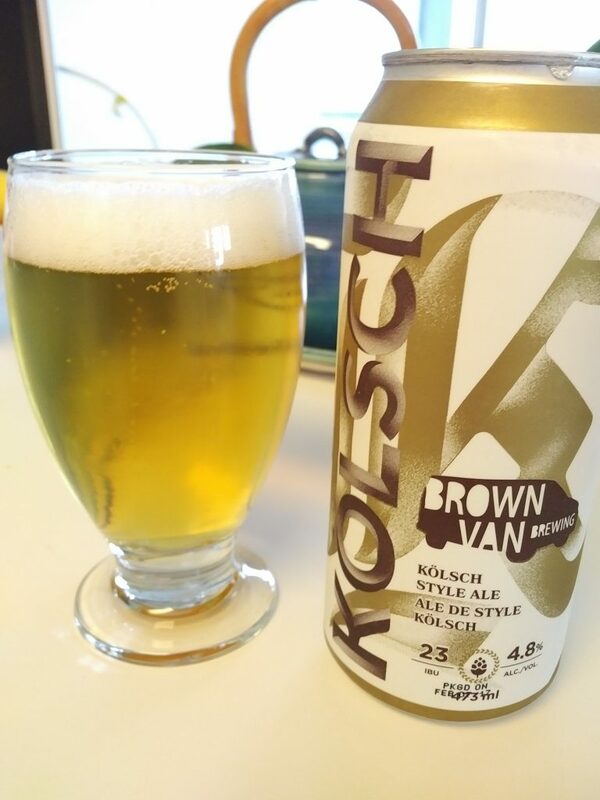 This offers the Kolsch style, popular in Ontario at the moment as is Vienna lager. The beer is very well made, clean, all-malt, with the straw-like, loamy taste characteristic of much helles and pils. Similar in IMO to Creemore Kolsch (apparently rebranded under the Mad & Noisy name and coming back soon in new livery). I admire the brewing skill but the particular taste profile just isn’t my thing. 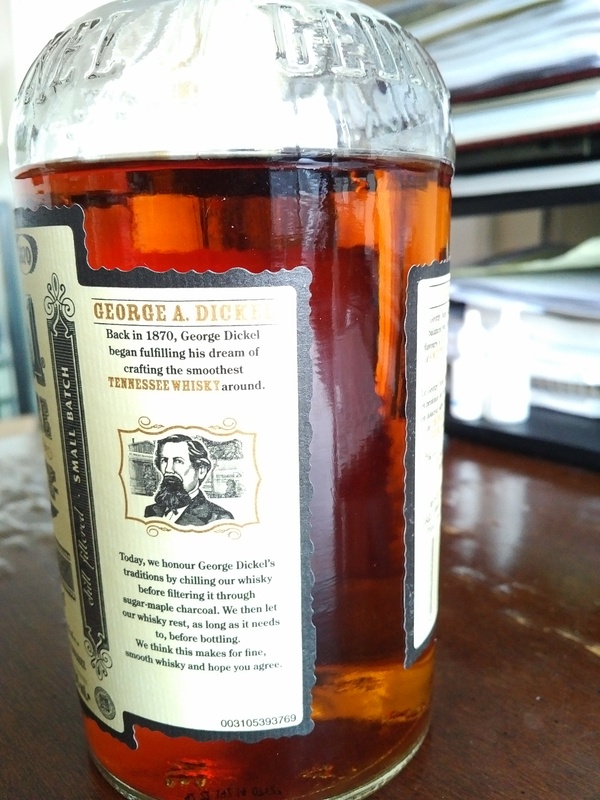 George Dickel is the other Tennessee whiskey, made since the 1950s but with roots in the 1800s. Very different to its brother-in-arms, Jack Daniel, both submit to the blandishments of the 19th century-era maple charcoal vat. It has an effect surely on both although it’s not always easy to pinpoint how. This Dickel is the best I’ve had in years. For a long time, a taste akin to “crunchy vitamins” was notable in the palate. Now, that element is subdued in favour of a buttery, light smoky quality and mild straight whiskey character of which corn is the driver. It drinks neat extremely well. A winner and my whiskey surprise of 2017. The article does a pretty good job, even by today’s standards, of explaining what’s what in a fairly technical area after all. I’d quibble with the implication that good blending should exclude neutral spirits. That was too strict a test, as indeed President Taft’s decision showed some years later (allowing whisky to include any distillate from grain). Also, the piece didn’t account for the fact that some distillers age the neutral element which makes a difference to the final character. In other words, requiring that blends be composed of all-straight whiskeys is too onerous, much as great results can flow from that practice. Indeed Beeretseq has always maintained that all straight and single malt whiskeys, except I suppose for single-barrel whisky, is a blend, in the sense that barrels are mingled which are drawn from different parts of the warehouse or different warehouses, and often different years. Each barrel can show a fair degree of difference from another even when the yeast and mashbill is the same. And then there are regional and annual changes in grains, or weather impacting the barrels. And the stave matrix in each barrel is never identical to that in the other barrels. Etc. But anyway that issue aside, the 1904 article is a good primer, even today, in that it doesn’t support blindly any one type – it all comes down to quality, to what’s in the glass. It must have taken some fortitude for a newspaper in the south, in 1904, to print this kind of article, with Prohibition’s breath hot on the doorways of editors’ offices. Almost all if not all of South Carolina must have been dry by then, too. York county, on the northern border of the state, had a Scots-Irish background though, so liquor interest probably continued despite pressure by temperance advocates. And there was an ostensible justification: to enable readers to follow a developing story in Congress. Despite the clarity the article afforded, it’s a fair bet that even most who read it, let alone the great numbers who never saw it, remained in the dark about whiskey and its different types. No doubt even today albeit the odd article appears in the general media to the effect of the one from 113 years ago, most imbibers have no inkling of what whiskey really is or how the types differ both within, and between, the great whiskey nations. Before the first war, there was a minor genre in American, and surely Canadian, journalism: a wending description of a junket. I’ve mentioned a few of them in these pages. One was a banker’s outing in the midwest to sample the real burgoo. A couple were tours of breweries and distilleries. The best of them have an understated humour, something not hard to achieve in the day before the sound-bite, relentless jargon, and “personalities” shouting over their guests came to define the media. This was a time when leisure was appreciated for what it was, people “set” awhile, had harmless fun, and beverage alcohol usually was part of it but not the greatest part. At most it facilitated literary flights by men who manage peoples’ money, or an impromptu running race or fishing outing (no fish was ever caught, one editor ruminated), or just chanting a few hearty songs. This July, 1898 story fits the bill mentioned, but has deeper interest for those who plumb the history of spirits. A group of newspaper editors from Maysville, KY went on a trip up north to visit Hiram Walker Distillery in Walkerville, Ontario. That’s a group of Kentuckians making homage to a Canadian whisky shrine, and not just that, but Kentucky boys from Maysville. Maysville, at the north end of the state on the Ohio River, is not just any town in the land of colonels, green hollows, and red-eye gravy. No sir, that’s where bourbon may well have been invented! You can look it up. 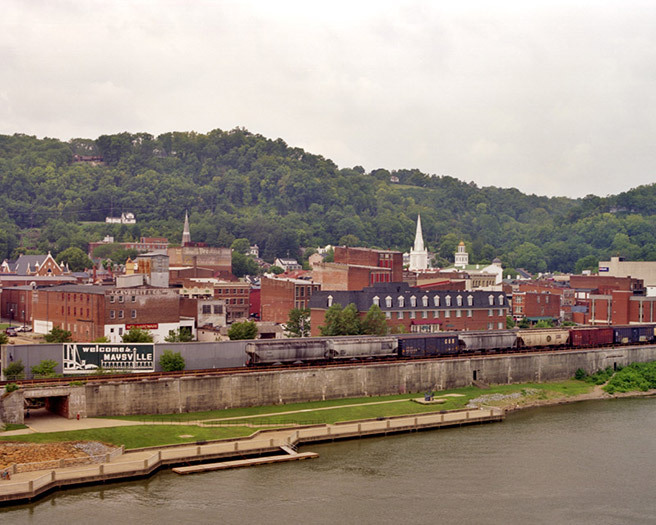 I’ve been to Maysville, formerly called Limestone and a point from which corn whiskey was shipped on flatboats down the Ohio to French New Orleans and other markets which helped define the whiskey-type (the long trip in wood and motion of the boats helped create the character). While Maysville was only in Bourbon County, KY for three years – the county lines kept changing – it is very likely the burg had a lot to do with making bourbon a chieftan of the whiskey-race. So why would Maysville grandees sally forth to another whisky locality? Coals to Newcastle? Well first, Canadian Club had achieved great success in the United States in the 1880s and 90s. It sold for the same price as good straight whiskey and while not a straight whiskey, people obviously liked it. Perhaps the fact that it was 100% aged, versus the American blends which used unaged neutral spirits to supplement the straight element, was part of it. Or the fact it was imported. Or both. Word about CC obviously had gotten down to those green hollers down there in the cream of the whiskey belt (ahem). And perhaps Hiram Walker & Sons invited and hosted them, to make friends and glean some good press even in the heartland of American whiskey renown. The trip is described in a somewhat more decorous tone than some of the others I mentioned. This was probably due to the fact that the Kentucky editors didn’t want to offend the native industry too much. Also, Prohibition was just 20 years away and its chilling effect was already making itself known across the country, what the bourbon historian Henry Crowgey called “a wave of Victorian rectitude”. It was the summer and there was room in the papers for a story of mild levity and potential excess, but things had to be kept in bounds. Still, the party clearly had a good time and the Hiram Walker people entertained them royally. There are no taste notes on Canadian Club, no pointillist comparisons with the nectar of sour mash. That would have been potentially embarrassing either to Kentucky or Ontario. It was a matter best left for private counsels on the steamer wending toward home. That is, we don’t know if the scribblers thought CC was better than the finest home product, worse, or on par. They hardly mention drinking alcohol, except obliquely when “punch”, and “Champaign”, are mentioned. I’d have to assume a skosh of CC went into each bowl despite the reputation Walkerville had at the time as a temperance town, odd as it may sound. And Hiram Walker’s men surely slipped a few flasks to the visitors before they ascended the gangplank to leave Walkerville. The trip was made by rail, boat, and carriage and one of the best parts is the delight the Kentucky people took on encountering the bracing cool winds of the Great Lakes in July. (Have you ever been to Kentucky in July…?). At day’s end, it was two great whisky traditions having a parlay, and like all parlays between Americans and Canucks since the 1812 War ended at any rate, it ends in good humour and handclasps. The Americans are the best friends we ever had, and vice versa. Even something as important as national traditions in whiskey can’t get in the way. building contains the general offices of Hiram Walker & Sons, proprietors of the famous “Canadian Club” distillery. The establishment is an immense one that puts to shame our Kentucky distillers. They can get a good many points from Walker & Sons. The various buildings of the plant are brick surrounded with drives and walks, while within all is scrupulously neat and clean. See, in Canada we don’t do low flagstone still houses stained with creepers and moss, good as the small tub whiskey was from those Kentucky grottoes. No, we make a beverage alcohol plant look like a Brahmin playing ground or a modern university campus. That’s Canadian savvy too you know. Note re images: the first image above, of Maysville, KY, was sourced from this municipal website. The second, the Canadian Club Brand Centre, was sourced from this Windsor-Essex tourism site. Intellectual property in both belongs solely to their lawful owner or authorized user. Use believed available for educational and historical purposes. All feedback welcomed. A quote which illustrates well the role of distilleries in the North Country of New York (see Part I of my account yesterday) appears below. It is from a news article written in 1902, 11 years before Katy Parker’s account I discussed yesterday. The 1902 piece discusses also many matters pertaining to the land-owning brothers, David and George Parish, who opened an area in Oswego County for settlement. The county is south of Lake Ontario at its eastern end, somewhat west of St. Lawrence County and the general area I discussed yesterday, but part of the same region with a similar economy and propinquity to Canada. A distillery was one of their enterprises. This interesting clan were originally British but had re-established in Germany to pursue their mercantile interests, whence they departed to invest and settle in the United States. The 1902 story was written in the light of both of an official history, the Hough book mentioned, and personal accounts of aged residents. It confirms everything Parker stated down to the principal grains used for whiskey, corn and rye. Contemporary manuals on distillation, notably Samuel M’Harry’s 1809 The Practical Distiller, published in Pennsylvania, also refer to these grains as the main whisky grains. M’Harry gives varying combinations: all-rye, all-corn, and mixes either equal or where one predominates. Clearly, the grists varied depending on price and availability. Also, most of the whiskey then was sold new, the concept of aging whiskey was not unknown but was in its infancy. A white dog spirit made from corn or rye would show less refinements of taste, less difference I mean, then the fully-aged article. Only later did corn-based bourbon and rye-based whiskey acquire geographical significance and that came finally with the concept of straight whiskey. Dealing in grains but also cattle was a key part of distilling then, directly or indirectly. American-born Canadian distiller J.P. Wiser had worked as a cattle dealer in the North Country before moving to Prescott to take up distilling there (see footnote in my Part I account). George Parish not only continued the distillery business, but greatly increased it. He took much of what the settlers had to sell, which made a market for them, and for years the town was as prosperous as any in these parts, corn was usually $1 and rye fifty cents per bushel. These he converted into whiskey and sold at twenty or twenty-five cents per gallon. It was pure whiskey, much better than the most of what’s sold today at ten times that price. In those days the people did not think they could do a haying, raise a building, or do a logging job without a good supply of whiskey. Accordingly there was a more or less local market for the whiskey, but it was only a fraction of what was made. For years it was drawn in barrels in large quantities to Fort Covington, where, I suppose, it was shipped by boat to Montreal and other places along the St. Lawrence and the lakes. At one time, owing to some duties, a long building was erected which stood one end in Canada and the other in the States, in which the whiskey was stored. When “the coast was clear” I suppose the barrels rolled right over into Canada. The hauling of this whiskey was quite an industry and afforded the farmers a considerable revenue. Nearly all those nearby the village took a hand in it more or less, while some made it a continual business for years, to wit, P. Piper, Bailey Cross, Foster Brownell and Charles Gibson. The distillery stables would hold one hundred and one head of cattle. These were bought of the settlers and as soon as fattened on the refuse or mush of the grain were driven to Montreal and sold. The cattle were fattened in the winter time. In the summer they bought and fattened hogs. These were mostly driven to St. Regis where they were slaughtered and shipped by boat. All this traffic, as may be seen, and as I have stated, made Parishville a live and thrifty village. Then, too, it was on the Turnpike, the main thoroughfare on which daily passed four-horse coaches, with much other travel, and had the largest and best hotel on the road. Earlier, I have written of the vivid reminiscences of Walter B. Leonard, a retired showman from the North Country of New York. He hailed from the part south of the St. Lawrence River east of Lake Ontario. Ontario was to the north and Quebec further to the east. Ogdensburg and Potsdam are two of the larger towns in the region. The main counties are St. Lawrence and Franklin. Writing in the 1930s, Leonard recalled his father’s hotel and saloon in Morley, a small crossing a few miles from Potsdam. This was the late 1860s, when he was a teenager. The account is full of colour and recalled a time when beer and liquor were usual incidents of small town life, part of running a hotel which served varied meals and hosted many special gatherings fondly evoked by Leonard. If I had a wand and could conjure my own tv program, I would do a Waltons–type show based on his memoir. “Life in Morley” is a good name, or “Morley’s Hotel”. The prohibition movement hadn’t made much headway in that part of the country then, but finally penetrated the established centres of influence: church, colleges, editorial rooms, legislatures. Forty years before the Civil War, liquor was even more a part of daily life. It is common to read statements to this effect for early America in general, but not often does one encounter tangible evidence of it. This was provided by Katy Parker, a local historian in Potsdam. In 1913 she wrote a multi-part history of early settlement in Parish, NY for the Potsdam Herald-Recorder. Parish was one of the pioneer towns founded in the area after 1800. One part of her history deals with the importance of distilleries to local life and the economy. It covers a period more or less co-terminous with the 1812 War. She includes the accounts of a farmer showing daily purchases for his farm. He was someone, she said, who had always been respected as a solid citizen and Christian. Yet liquor figured very large in the accounts, gallons and gallons of whisky and other drinks next to quotidian purchases of lumber and the like. The liquor was partly used in connection with “training”, which I think must have meant training cattle and horses to carry agricultural implements. (We remember this meaning in the term “drive train”). Anything to do with the labour of a farm, especially clearing land and raising buildings and fences required liquor to ease the travail. Sugar and “ginger” also figure in the accounts. Ginger is our old friend from the cocktail posts I wrote a while back, no doubt it was used with the sugar to make early cocktails. The author’s calculation of distillery profits is, well, sobering. The profit declined when a tax on liquor was re-imposed to help fight the 1812 war with Canada, but as she notes, Mr. Hoard, her example of a county distiller, didn’t stop on that account although he grumbled. Her account makes clear this liquor was sold new off the still, no aging. It would have been distilled once or twice and probably rectified roughly through charcoal in a tub. It was likely full of fusel oils, but people drank it all the same. It was this background that enabled a tolerant attitude to booze in the time covered by Leonard’s recollections and well into the 1800s. By 1913 when Katy Parker wrote, times had changed. There is a wondering tone in her account, as if to say, how could things have changed so radically in just 100 years? A book written in Canada in the 1880s, dealing with Chateauguay, a part of Quebec south of Montreal settled by British immigrants, states that the American North Country sent plenty of contraband whisky to the area. The writer, oddly to my mind, considers that the whisky was based on potatoes (see p. 179). It is odd because Parker mentions the classic American whiskey grains of rye, corn, and barley as the basis of Hoard’s distillations, not the potato. Maybe some New York distillers did use potatoes, perhaps too in the riparian counties east of St. Lawrence County. Anyway, the book does confirm that lots of whiskey was made upstate in New York in the early 1800s and found its way to Canada. Of course, what is across the water from Ogdensburg? Prescott. Who founded a distillery there? John P. Wiser, one of the Big 5 in Ontario before consolidation in the 1920s. What did Wiser make? Rye whisky. Where was he from? Oneida County, NY, just south of the region we are talking about. * What did Hiram Walker, another American, make in Canada? Rye whisky. Two communities separated by a border but of largely British origins and unified culture, making the same kind of whisky after rum lost its hegemony in the wake of the American Revolution. Later, the whisky types, although not so much the ingredients, diverged, but until the Civil War cousin-distillers would have made similar products: rye- and corn-based whisky, with not too much aging, and lotsa taste from rudimentary distillation. And yes, maybe some potato spirit crept in there, an early form of vodka. 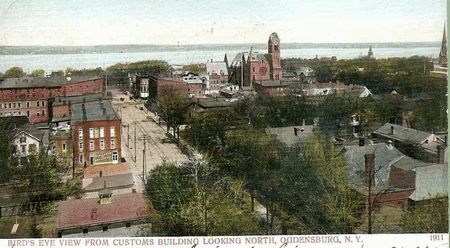 Note re images: the image above of Ogdensburg was sourced at this geneology site. All intellectual property therein or thereto belongs solely to its lawful owner or authorized user. Image is believed available for educational and historical purposes. All feedback welcomed. *At least one account stated he was Vermont-born, see this obituary in 1911 in an Ogdensburg paper. At all events he had an extensive American background before moving to Prescott. [See as continuation Part II of this account]. 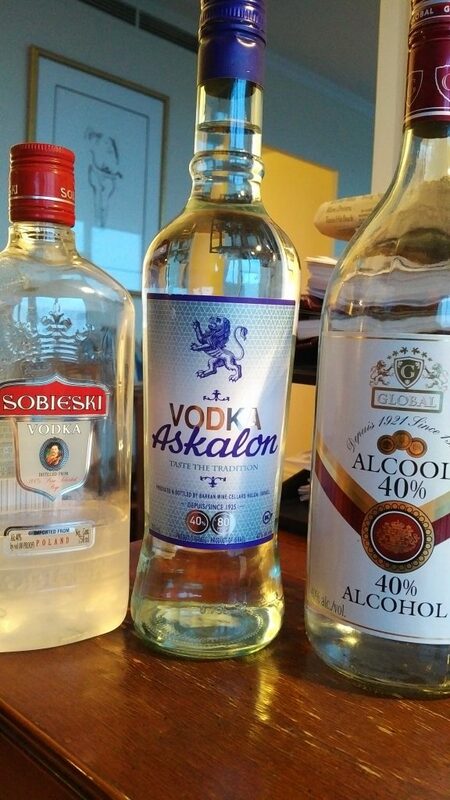 Two of these are not technically vodka. The Global Alcool, sourced in Quebec, is “alcohol” or neutral spirit and distilled at 94% ABV. It is reduced to 40% for this bottling. The distillate must come off the still at 94% since the Quebec Liquor Board, or SAQ, sells it at that strength too, yes, almost 100% pure alcohol. If Global sells the 94% ABV evidently that is the basis for proofing-down a “junior” version to 40%. 94% ABV, or 188 U.S. proof, is a typical distilling-out target for neutral spirits, that is, GNS not intended for vodka. For vodka, you want it generally at 95% ABV or between that and 96%. In some places indeed, e.g., the U.S., it must be distilled at 95% or over to serve as vodka. Also, vodka by law in many places must be charcoal-treated. The Global spirit is probably similar to the grain whisky of Scotland and Canada before aging, if it is made from grain anyway. The label is rather vague on where it is made, and does not indicate the fermentable base. Global is an East European-based drinks business but has facilities somewhere in North America too, it appears. I’d think the Alcool is a rye- or potato-based spirit. The Sobieski is a well-known Polish brand, rye-based, reasonably-priced. The Askalon is made in Israel. Given that distillation originated in the Middle East and Jewish people lived for 1000 years in Poland where vodka quality is a byword, the Israel connection is not as unusual as it might sound to some. 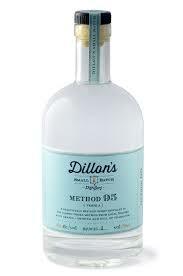 The Dillon Method 95 is a vodka-type spirit distilled from Niagara grapes, so not called vodka as such since not made from grain. Each product is excellent and different. The Global is very full-flavoured, a touch fruity, quite different from typical vodka when tasted side by side. The Sobieski is creamy, sharp, bracing, with maybe a faint smell of charcoal. The Dillon method 95 is sweet and creamy too, I can’t really tell that the substrate is grapes, it just tastes like a good, full-bodied vodka. The Israeli one has a note of flint or stone, with a full taste, faintly spicy and smoky. It almost reminds me of arak, which the company makes too. Could the vapours of the arak somehow get into the tanks of vodka …? Stranger things have happened, but it’s a first-rate spirit either way. Three excellent spirits to drink neat or mix, you can’t lose. In my last post I indicated that from early days a hallmark of Canadian Club, which applies to Canadian whisky in general, is that it is aged for years in wood barrels. The law requires now at least three years of aging, originally it was two. CC well exceeds that, even for the base brand, as it has been aged at least five years (to our knowledge) since c. 1900. Canadian whisky is almost always composed of what has been termed a heavy and light component. The heavy one is distilled generally under 80% abv, the light one at about 94% abv. The streams are combined when new and then aged, as for CC, or aged separately and blended at maturity, as say for the Wiser`s brands. The situation in Scotland is similar, their “grain whisky” is our light whisky and it is aged and then blended with malt whisky to form one of the blends of commerce, Johnnie Walker Black Label, say. The light whiskies in both places have some secondary constituents, compounds apart the ethanol and water that give flavour and body, often called for convenience congeners. But the heavy whiskies have far more congeners since they are distilled in a less thorough fashion. The idea is to get a balance of flavours by blending them, and also the grain or light whisky element is cheaper to produce than the heavy whiskies. This means the products can be sold at a lower price than a bottle containing 100% heavy whisky (a single malt in Scotland, in Canada a rye whiskey distilled under 80% abv). The grain or light whiskies aren’t quite neutral and spirit of a slightly higher purity is employed to make vodka, for example. Also, vodka is subjected generally to charcoal filtration to further cleanse and purify the spirit. Grain whisky going into the barrel for years to be blended with heavy whisky on the other end doesn`t need such refinements and indeed they are probably not desirable as they will detract somewhat from flavour in the same measure. Still, the grain or light whisky element is quite neutral in character as compared to the boisterous flavour of a malt or straight rye (or bourbon, brandy, tequila, heavy rum or other spirit of the older, pre-grain spirit type). The Americans have a blended whisky too but they don’t usually age the neutral element. Why? In 1943, a U.S. Senate hearing in Washington on the liquor industry shed some light. Philip Buck, a federal lawyer, stated that American distillers, the “experts”, saw no advantage in doing so. What he meant was, as grain spirit was virtually pure ethanol, it had little flavour from congeners. Therefore, it was ready to drink, just as straight whiskey aged four years, say, is ready to drink. The straight whiskey, albeit starting as heavily congeneric, is modified by the long barrel aging into a pleasant-tasting drink. This results from the many chemical interactions in the barrel, between congeners in the barrel deriving from fermentation and between these and substances extracted from the wood. Straight U.S. whiskey has so much wood in it too due to aging in new charred oak barrels that blending it with white neutral spirit lends some of that character to the latter – there is plenty to go around so to speak. Then why do Britons and Canadians age the neutral (or near-neutral) element? The real reason may be, marketing. As Canadian Club’s lawyer explained in 1909 to President Taft, consumers were thought to want a whisky that had no fusel oil (a term for some of the unpleasant congeners in new spirit) yet one that was aged. Technically, as Philip Buck saw in 1943, these two things are at least partly inconsistent. A new spirit without fusel oil – vodka for practical purposes – doesn’t need aging. Yet the public, probably from the years before neutral spirits existed in the market, had the habit or reflex to want aged whisky. The answer: give them a product which was largely neutral-tasting – no fusels – but age it anyway. This seems to have been the business strategy in both Scotland and Canada where blended whiskies emerged concurrently in the later 1800s. (Of course too, the aging would improve the small amount in the blends that was straight to start with, in the CC way of doing it that is but not otherwise). Maybe too aging the neutral spirit produces a different kind of drink, especially as the straight part wasn’t as woody/complex as if aged in a new charred barrel in the U.S. Also, some chemical reaction would take place by virtue of aging the neutral component that perhaps was felt to benefit the palate. Oxidation of ethanol, which produces green apple flavours, is an example. Well-aged Canadian whiskies, although generally having only a faint straight character, do get a certain richness and complexity from the wood content (sugars, tannic acid) in both the heavy and light elements. It may have been accidental, but a Canadian style certainly emerged finally. Canadian Club`s website calls it an almondy richness and I agree with that. Another way to describe it is a cigar-box quality. The regular Canadian Club used to be labeled six years old and I think it was better when it was, but it is still an almondy drink, and even more so for the iterations you can buy at nine, twelve, and twenty years age. It`s another style, different from Scotch mainly because the heavy element is different – straight rye (often) instead of malt whisky. It is not because of the light or grain whisky element, which is similar organoleptically in both countries. As is the barrel. Canadians generally use less of the heavy element in their blends than the Scots, although hard information is not easy to come by. From all I have read and heard, I think most Canadian whisky uses under 10% heavy or flavouring whisky. The Scots probably use 25-50% malt whisky in their blends, depending on the quality. Of course, straight rye is a pretty assertive drink (buy some Lot 40 to see), so it doesn`t make sense to argue the additions should be parallel in this sense, but still, the average Scotch blend has more character than the average Canadian whisky, IMO.